South Korea and Morocco on Thursday signed six MOUs on deepening bilateral relations in trade, environment and education on the occasion of their prime ministers' talks in the North African country. 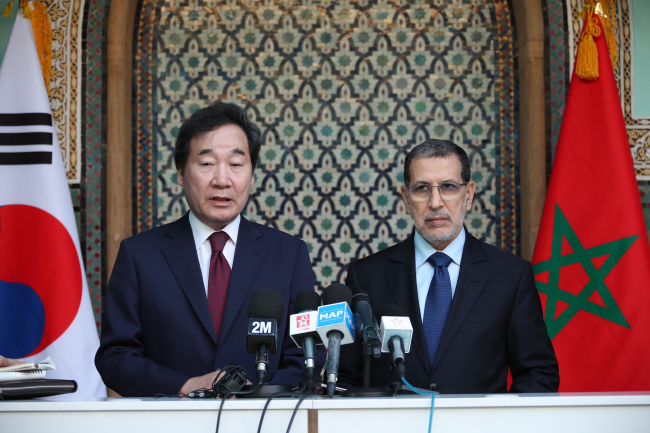 South Korean Prime Minister Lee Nak-yon arrived in Rabat, the capital of Morocco, earlier in the day and held talks with his Moroccan counterpart, Saadeddine El Othmani. Lee and El Othmani, who were meeting for the third time this year, confirmed their willingness to expand and deepen their countries' bilateral relationship and to launch various joint projects elsewhere in Africa. They held their first bilateral talks of the year on the sidelines of the World Water Forum in Brazil in March, and the Moroccan prime minister visited South Korea in May for talks with Lee. "Morocco is the first African country to have a permanent South Korean embassy in the continent. I have met Prime Minister El Othmani for the third time this year. The Republic of Korea has had reciprocal visits of prime ministers only with Morocco this year," Lee said, highlighting the special meaning of his visit. In response, El Othmani said it is very rare in diplomacy that prime ministers of two countries meet three times in a year. He also expressed hopes that the two countries' determination to widen bilateral relations will bring mutual benefits. Following the talks, the two countries initialed six MOUs, which included South Korea's provision of an additional $600,000 to a Moroccan automobile vocational training center and a joint research project on smart multi-microgrid infrastructure to help ease electricity shortages in Africa. Other MOUs call for closer two-way cooperation in higher education, green technology research and development, new energy regeneration and trade administration. Lee said the six MOUs will pave the ground for expanding exchanges in the private sector as well. He also asked the Moroccan prime minister to pay closer attention to South Korean companies seeking to bid for power infrastructure projects in Morocco. Meanwhile, Lee offered CDs autographed by South Korean pop idols BTS and SG Wannabe to El Othmani for his two daughters, who are known to be K-pop fans.